The kovdev team is back again with another icon pack, this time tackling their vision for what round icons should be. If you did not already know, kovdev is headed by Dave Kover, who you might catch around the DL sphere from time to time. He has been pumping out quality icon packs and themes on Android for quite some time, such as Nox and Stark, so we always get a little giddy when he releases new work. His newest pack is called Audax, and as you can see, it is a circle-based pack. While countless circle packs were hitting Google Play earlier this year, it appears that kovdev would rather take their time, meticulously going over each icon to make sure they were just right before finally being released to the public. If you ask us, the wait is worth it, considering this pack could reinvigorate the freshness of circles on your home screen. In total, users will have access to 2000+ icons and plenty of cloud-based wallpapers which you can download to your device. 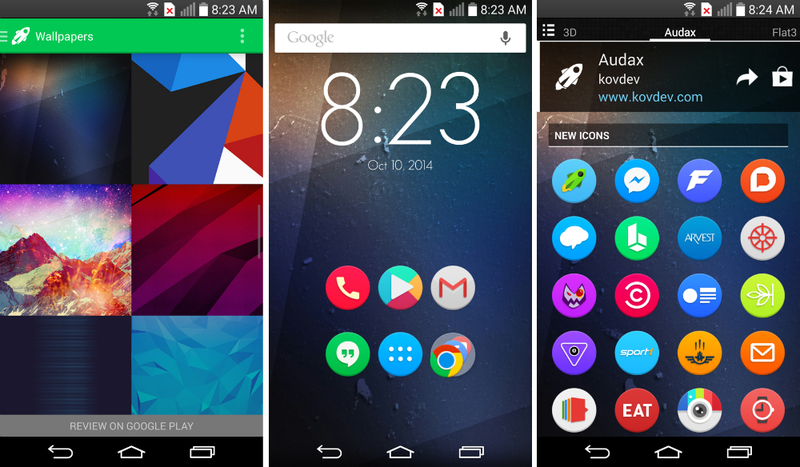 For those who may download and use with one of your custom launchers (most 3rd party launchers are supported), kovdev recommends bumping up your icon size to 130%, which gives off the Google Now Launcher (GNL) feel and experience. Priced at just $1.99, users can also expect to see updates going well into the future for this icon pack, so go check it out and let Dave know what you think in the comments below.